Welcome to the new and improved Innofresh.com. 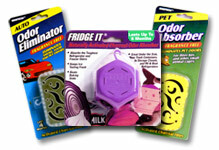 Please have a look around and learn how Innofresh can help you with your odor problems. We have made a bunch of changes to improve your experience. We made the site mobile friendly so you can solve your odor problems on the go. We added a bunch of use cases to help you understand how Innofresh Odor Absorbers can solve your odor problems. Reduces the number of steps needed to discover and purchase the product you need. Adds payment options such as PayPal.